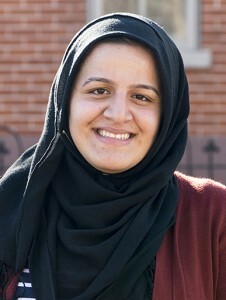 DENVER— University of Colorado Denver senior Nadeen Ibrahim was named Colorado Leadership Alliance (CLA) 20167Student Leader of the Year at the CLA Summit on Saturday. The award is given by the Denver Metro Chamber Leadership Foundation and the Boettcher Foundation annually. Ibrahim has made an impact in the community and on campus. She was named the 2016 Community Builder of the Year by the University of Colorado Denver and is the youngest Coloradan to serve on a governor-commissioned board, appointed in 2015 by Gov. John Hickenlooper to the Colorado Department of Public Health and Environment Board of Health.